We appreciate you choosing us as the pediatric center for your most precious possession: your child/children. We know you have many options in pediatric medicine in Raleigh, NC and feel honored that you have chosen us. We think you’ll find that a small pediatric clinic like ours offers a more personal approach and feel. Before your first visit to our Raleigh, NC pediatric center, please read over our new patient information, our policies, and our insurance and billing information. Expecting your first child? Congratulations! We offer a complementary prenatal visit, after office hours, where you will meet with one of our doctors or our nurse practitioner. The prenatal visit includes a brief presentation about our pediatric services and the upcoming hospital experience. There will then be time to answer any questions or concerns you may have and a tour of the office is given. We also have a certified lactation consultant on staff to support new mothers through the process of breastfeeding. Although our lactation consultant will not be present at the prenatal visit, we offer the opportunity for all expectant families to speak with her before your new child arrives. We feel that anticipatory education is beneficial to everyone involved and encourage you to call us at 919-787-9555 to schedule a prenatal and learn about our practice! 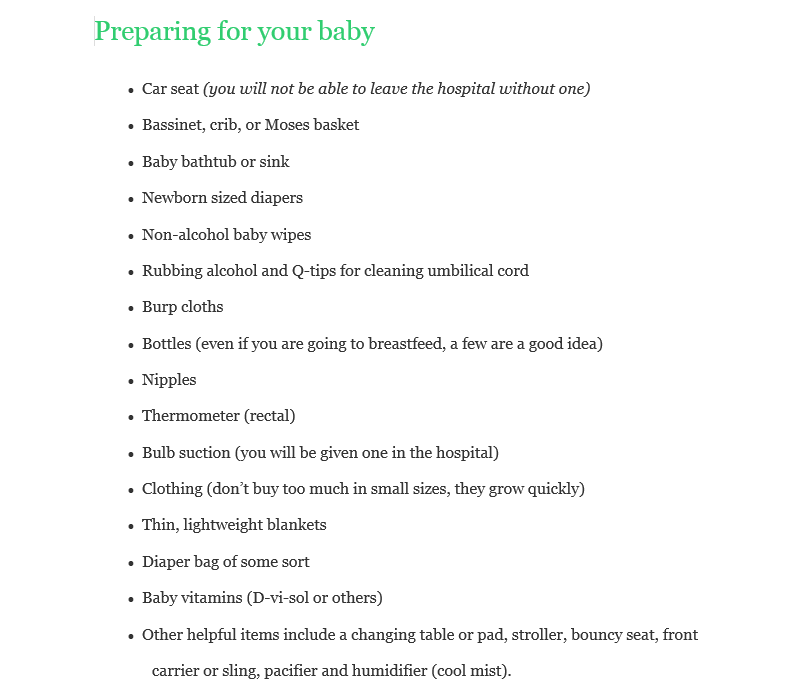 In anticipation and preparation for the baby’s arrival and homecoming, a list of basic necessities is in the link below. We are glad to discuss questions you might have about equipment at a Prenatal or newborn appointment. New to the Practice? Welcome! Welcome to Pediatric Partners! We look forward to meeting your family and becoming your Patient Centered Medical Home. After you have scheduled your first appointment to Pediatric Partners, we will send you an email inviting you to our interactive Patient Portal. Please log in and begin to edit the “My Profile” portion; this will cut down on paperwork that will need to be completed on the day of the appointment. Also, please take some time to review our policies and insurance and billing information. We want everyone to be informed prior to the first visit to our office! On the day the appointment, please arrive 15 minutes early and bring the patient’s insurance information and card. If you have additional questions please contact us at (919) 787-9555. We look forward to meeting you and your family! All calculations must be confirmed before use. The authors make no claims of the accuracy of the information contained herein; and these suggested doses are not a substitute for clinical judgement. Neither pediatricpartnersraleigh.com nor any other party involved in the preparation or publication of this site shall be liable for any special, consequential, or exemplary damages resulting in whole or part from any user’s use of or reliance upon this material. Dr. B was recommended to us before we moved to Raleigh over 9 years ago. We have had the pleasure of seeing the practice from its inception to today. All the staff are amazing and I take every opportunity to recommend them to my friends! I take my newborn twin boys here and love them. They have the most caring, amazing and knowledgeable team with the best lactation specialist Heather. My boys see Dr Walker, she is so loving and great with them, she treats them like her own, which as a first time mom makes me feel very comfortable! I would travel with no problem to keep bringing my boys here because I know they’re in great hands!! We have been with them since my first born 6 years ago. Just had my 4th with them. I love every single doc here. They take time to develop a relationship with our family and I feel so comfortable there. I love this office. We recently moved to Garner and there is no way I’m switching doctors to be closer. It’s well worth the extra miles for me to drive. You won’t find a better pediatrician office in Raleigh. Could not be happier with the care this practice has provided our five little blessings 🙂 all providers and staff go above and beyond to provide exceptional patient care, thanks tor all you do!! !